This website and its contents from time to time (“site”) are available to users only on the terms appearing below. This site belongs to The Hills Group Ltd, a company registered in England and Wales under number 01478385 and whose registered office is Wiltshire House, County Park Business Centre, Shrivenham Road, Swindon SN1 2NR(“Hills”). The legal information appearing below is provided by Hills for the benefit of Hills itself and also its officers, employees and agents and subsidiaries and their officers, employees and agents from time to time. Registered Office for all companies: Wiltshire House, County Park Business Centre, Shrivenham Road, Swindon SN1 2NR VAT No. for all companies: 194371837 together the “Hills Group”. The owners of this site are not responsible for the contents or reliability of third party websites linked to this site and do not necessarily endorse the views expressed within them. The listing or provision of a hyperlink to a third party’s website shall not be taken as endorsement of any kind. We cannot guarantee that these hyperlinks will work all of the time and we have no control over the availability of the linked pages. You should not create a hyperlink to this Website from another website or document without the Hills prior written consent. The owners of this site hereby grant visitors to this site access to the Site’s web pages conditional upon your agreement to accept the application of the laws of England to govern matters between us in relation to this Site and you agree to indemnify us and not hold us liable for the result of any actions you may take based on the information contained herein. While every effort is made to ensure the accuracy of the content of this site, this cannot be guaranteed. Hills uses reasonable care to ensure that it does not create, replicate or transfer any computer viruses. However, viruses unfortunately exist, they are not always easy to identify and new and previously unknown viruses are continually being created and transferred. Accordingly, no guarantee can be given that this website and any software, email or program from Hills is virus free. 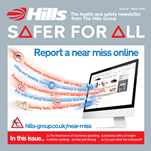 Users and recipients are advised to take their own precautions as Hills accepts no liability in this regard. This site may at times store and/or capture personal information where these have been supplied willingly by you as a web user. We will only use the personal information you provide to respond to specific enquiries about our business or to contact you about our products and services and future promotions or news which maybe of interest to you. By providing these details you agree that we can contact you to advise you of such matters, however you may email us at mailto:info@hills-group.co.uk to request that we no longer send you this type of information. Click here for our general privacy statement. other than as stated above.